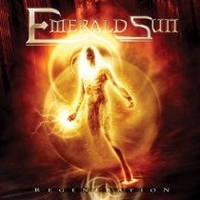 Regeneration is the third full-length album from Greek power metal sextet Emerald Sun and from the outset it is clear that they worship at the altar of the likes of Helloween and Hammerfall. The album is choc full of soaring vocals, catchy guitar hooks, full speed bass drumming and a strong keyboard presence. The musicianship of all members is at a high level and the songs are extremely listenable power metal songs with a real emphasis on the ridiculously happy side of the genre, á la Freedom Call and Timeless Miracle. Its clear that Emerald Sun don't take themselves too seriously and this is most readily apparent in the song Planet Metal which is highly reminiscent of Edguy's more humorous side, due to the use of chipmunk vocals to represent aliens. Yeah, you read that right! Additionally the band's choice of bonus track is a cover of I Need A Hero. This really shouldn't work, but you can't help but smile and sing along with this utterly camp rendition of the Bonnie Tyler hit! The band really shines on some tracks, most notably the epic length Fantasmagoria which clocks in at over 12 minutes and manages to hold your attention throughout. However, there is also a lot of derivative power metal with the power-ballad-by-numbers Chasing The Wind being the main culprit. This is an album that will be enjoyed by pretty much anyone who appreciates Euro power metal. That being said, Regeneration is not going to convince any power metal detractors, nor does it really shine as a sterling example of the genre. It is a good, enjoyable album but your CD / MP3 collection won't be any worse for not containing it.